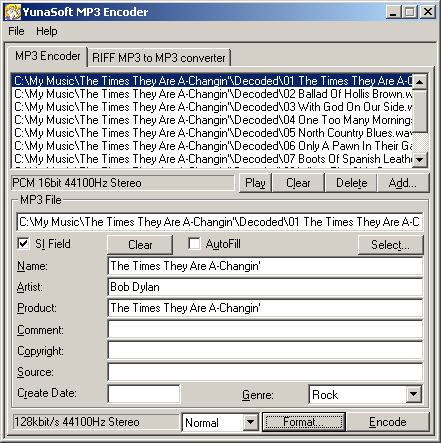 Yunasoft is an application coming from Japan, but it is not really an MP3 encoder - actually, it is a frontend to the FhG ACM MP3 codec. It offers several features related to tagging and whether to save output as WAV-wrapped MP3 streams or standard MP3 files. The main differences between versions 0.4.3e and 0.7 hosted here are that 0.7 supports batch encoding and stripping the RIFF headers from WAV files. But starting with 0.7, YunaSoft required that users register for free at their web site to obtain a registration key. Without that key, the program encodes no more than 30 seconds of audio for each file. The registration window can be reached in File menu. A mirror of the YunaSoft webpage can be seen here.